The reactable is a multi-user electronic music instrument with a tabletop tangible user interface. 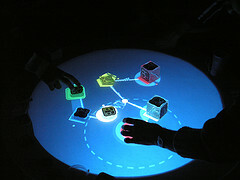 Several simultaneous performers share complete control over the instrument by moving physical objects on a luminous table surface. By moving and relating these objects, representing components of a classic modular synthesizer, users can create complex and dynamic sonic topologies, with generators, filters and modulators, in a kind of tangible modular synthesizer or graspable flow-controlled programming language. It’s always useful to read articles from other writers and practice something from other web sites.